So far, I’ve been just bringing them home and letting them sit. I haven’t replaced any. But I’ve been wondering what to do. Should I replace CFL with LED bulbs now or wait until they burn out? If I replace the bulbs as they burn out, then I’m getting full use out of them. Though CFL bulbs have gone down in price, they still cost money. Should I get full use out of them? On top of the bulbs around the house in sockets, I’ve still got some that have never been used. And, it’s not like I can just throw them away. CFL bulbs have mercury, so disposing them involves taking them to the hardware store, where they are somehow sent to be decommissioned safely. On the other hand, maybe replacing them now isn’t a bad idea. After all, CFL bulbs do last for a few years. So I could be waiting a good long time to replace them. 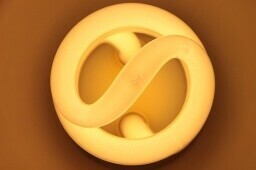 Since LED bulbs cost less to operate, getting full use might actually cost me money. Keeping CFL bulbs because I already paid for them is an example of sunk cost fallacy. The bottom line here is that the cost I spent for them has already occurred. I’m not getting the money back either way. Therefore, no consideration should be given to what I paid for the CFL bulbs. I should only look at the cost impact starting now. In that case, replacing the CFL bulbs would be to my advantage. I have sort of reached a decision, and it’s sort of a hybrid. I plan on replacing a good chunk of the CFL bulbs now. We have ten lamps around the house that we use for many hours a day. Two already have LED bulbs that I purchased a few years ago to see if I liked them. I will replace the bulbs in the other eight. In addition, we have a few overhead fixtures that get a lot of use. I’ll probably replace those too. But, for lamps that we don’t use all that often or for overhead lights that we don’t use a lot, I’ll keep the CFL bulbs in place. We’ll probably save a little money on the electric bill, which will be nice. I figure it will probably take about 1-2 years to recover the cost of each bulb based on how much we have the lights in question turned on. Plus, they’re safer. Lamps have been knocked down on occasion. I know that people don’t freak out like they used to about the levels of mercury inside a CFL bulb, but in the event of a broken bulb, no mercury is better than even a little bit, right? 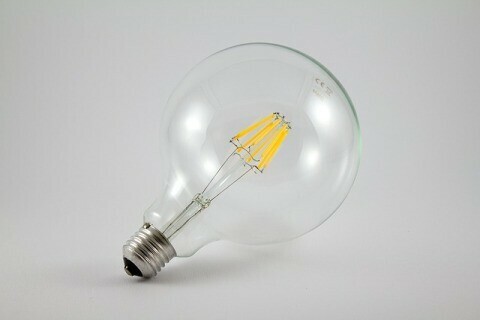 LED globe bulbs are identified by the yellow filament inside. The one set of bulbs we won’t address now, but that I want to, are the bathroom bulbs. We have the fixture that has the round globes. Only recently have they started making LED versions. Unfortunately those are still very expensive (about $4 per bulb) and not yet part of the subsidy. We have three bathrooms with 15 bulbs total. There’s just no way I’m spending $60 to replace those light bulbs. What Happens To The CFL Bulbs That Are Still Good? Lesser used lights – For the lights that we use occasionally, where we’ll leave a CFL bulb, I’ll just replace it with another as the existing bulbs burn out. Garage door opener – The vibration of the garage door opener burns out the lights inside pretty quickly. I assume that it would chew through LED bulbs just as fast. The CFL bulbs would be just fine for this purpose. Spares – You never know when you need a backup bulb. Having something is better than having nothing. Have You Switched To LED Bulbs Yet? Readers, what have you done? Have you made the switch to LED bulbs yet? Are you still using CFL bulbs? Or did you manage to stock up on incandescent bulbs before they were banned and still use those? That’s cool. Definitely something I might use. I have ended up swapping out the lamps and one bulb above the sink that we keep on all the time when we’re not home. Between the safety benefits of not having lamps fall over, plus that one bulb that I know we use a lot, we’ll definitely make a positive benefit, even of CFLs. I’m waiting until the CFL burn out to replace them. This worked well so far because the LEDs price has dropped significantly over the last few years. However, if the price is stable now, it might be time to replace more CFL bulbs. I’m definitely going to tackle the bathroom fixtures once the price drops. Those bulbs just chew up so much energy. I know they’re not on for that long, but it still drives me nuts every time they’re on. And when the kids leave the bathroom light on by accident, that’s total stress that can hopefully go away with LED lighting. Great article! I replaced CFL with LED bulbs in my room, and it dramatically reduced the cost of replacement lamps along with maintenance time and fees. It inspired me to run out and buy a bunch of CFLs, too. Forthwith, I dropped one on the floor of the hall closet, presumably spewing mercury all over the coats, jackets, and vacuum cleaner. Because I’d not yet heard that CFLS contain mercury, I did nothing about it, presumably poisoning myself, the dogs, and all the moths in the closet. I soon found I hate, loathe, and despise the quality of the light CFLs emit. It actually HURT my eyes. So I took, all those expensive doodads out of the fixtures and replaced them with incandescent bulbs. When we were told the Forces of Good would take away light bulbs that don’t turn your hall closet into a Superfund site, I ran out and bought as many incandescent light bulbs as I could get my hands on. Turns out that even the young pups hate those things. He got rid of them and fitted all the fixtures in his house — including the recessed fixtures in the kitchen ceiling, with those Edison bulb things, where you can see the filament. These emit a dim light, inadequate for moving around, really, in the house. You can see your way to the bathroom after dark, but that’s about it. When the last of my stockpiled incandescent bulbs dies, I’m throwing out all the lamps and replacing them with candles. I know with the CFLs, they ended up backing off the whole thing about how scary it was because they had mercury. That was pretty crazy for awhile. I’ve not been a big fan of the Edison bulbs myself.